Fresh air, water, mountains and plenty of opportunities for adventure. 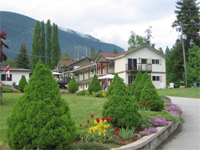 Our Bed and Breakfast style resort provides an excellent starting point for your stay in the Nelson area. A breathtaking view of the Kootenay Lake, only an eight minute drive to the city of Nelson, and close to the Kokanee Glacier Park. The Kokanee Glacier Resort is an excellent starting point for exploring the best of the Kootenays. Comfortable suites complete with private bedroom(s), kitchens and many other amenities.